Fort Worth, Texas – Kyle Busch was “bad fast” Saturday afternoon at Texas Motor Speedway, and the Nationwide Series record book took a beating because of it. • Became the first driver to win three consecutive Nationwide races at TMS. • Is the first driver to win from the pole in 17 Nationwide races at TMS. • Raised his own track laps-led mark from 174, in November’s O’Reilly Challenge, to 178. • Bagged his third victory and eighth top-10 finish in nine races at TMS. • Scored his second series victory and fourth top-10 finish in five starts this season. Brendan Gaughan, who finished 37th Saturday, still owns the record for most consecutive wins at TMS in one of NASCAR’s three national touring series with four. Gaughan swept both NASCAR Camping World Truck Series events in 2002 and 2003. But Busch, who has won six races this year in those three touring series – two in Sprint Cup, two Nationwide and two Truck – is closing. Bad fast. Busch’s only real challenge began to unfold in the final 11 laps, after John Wes Townley brought out the day’s fourth caution with a crash between Turns 3 and 4. Stewart, running sixth at the time, opted to pit for four tires and fuel while Busch and Brad Keselowski stayed out. Stewart restarted in seventh, moved around Keselowski and into second on Lap 197 but didn’t have enough race left to overhaul Busch. “It wasn’t an easy day,” said Busch, who finished 1.447 seconds ahead of Stewart. “Made it look easy, but I‘m ready for a nap.” Busch nonchalantly said he never felt sure he was going to win, as Jeff Burton, Keselowski and Stewart all mounted challenges. And, he noted, a lot of time had passed since his most recent victory here in November. As it was, only Stewart and crew chief Ernie Cope opted for four fresh tires on the final stop. Busch and crew chief Jason Ratcliff were basically out of options, having used all six sets of their allotted Goodyear Eagle tires. “We had a set of tires that had 10 laps on’ em, that’s the best thing we had,” Ratcliff said. Again, Stewart said he was rolling the dice when the race went green for the final time on Lap 194. Stewart, driving for fellow-Cup owner Kevin Harvick, posted his fourth top-10 finish in six races at TMS, and his second top-10 result of 2009. Keselowski, meanwhile, earned his third top-10 finish in six starts at TMS in his backup No. 88 Hellmann’s Chevy. Keselowski , who spun and wrecked his primary car in qualifying on Thursday, started 42nd because of the switch. 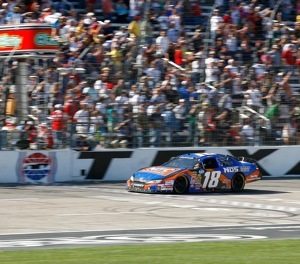 Saturday’s finish moved him from 15th to seventh in a points race led by Carl Edwards. A late-race incident with Joey Logano forced Edwards into the wall down the backstretch and out of contention for the win. Edwards finished 18th in the No. 60 Scotts Ford Fusion. With Harvick sitting the race out and performing color commentating duties on ESPN, Busch moved into second in the points race, 38 behind Edwards. Keselowski said he didn’t know what to expect from his backup Chevy, much less starting at the rear of the field. But he knows Busch is the complete package.